Over the first three years of the Ottawa Redblacks existence, the man behind Redblacks social media – Mat Smith – was always generous with his time for us (2014 interview here, 2016 here) and the #RNation fanbase. Mat moved on from OSEG following the 2016 season to start Harbourfront Media. We caught up to reminisce and look at what’s ahead. @DefendTheR: Suffice to say it has been a big year for you since last we spoke. Catch us up on what went on with you since last summer – both professionally and personally. @smith_mat: It’s been a big year, and a bit of whirlwind, to be honest. In my professional life I was lucky enough to win a Grey Cup, launch a business, and take a dive into politics. The real highlight of the past year, however, was getting to marry my best friend, Kadie Smith. 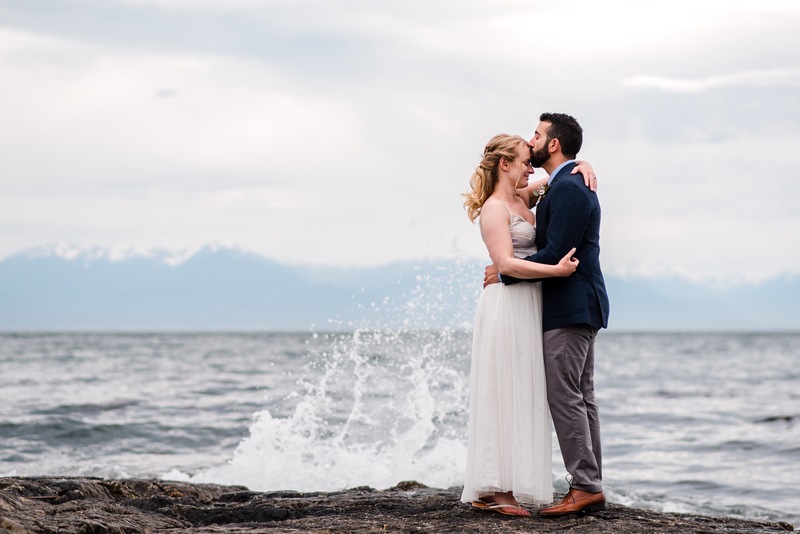 We had a small, intimate ceremony on the beach in Victoria, BC. It was definitely a day I’ll never forget. Being part of a Grey Cup champion has got to be something special. Can you share a personal story or two from Grey Cup Week that stood out for you? Knowing this would be my last year with the team, I definitely made an effort to stop and take it all in more than I did in 2015. Besides the obvious – the locker room celebrations, seeing Hank run out onto the field after being hurt in warmup, Grey Cup parade in Ottawa, etc., there are a few other moments that stand out to me. Call me crazy, but I can pinpoint the exact moment I knew we were going to win the Grey Cup. It was our last full practice and Juron Criner made the best catch I’ve ever seen in person. The mood to that point had been positive and upbeat, but it went to another level after that catch. The catch seemed to spark everyone on the team and eliminated any doubts that may have been lingering. I left the practice facility with chills running down my spine after seeing the players so hyped. The high stayed with the team until after we had won. It was special. Another memorable moment was post-game following Henry’s media availability. I was heading out with Kadie to take our photo at midfield (something we never got to do in 2015). The stadium was completely empty – we were the only ones on the field – until I noticed Hank, followed by a scrum of photographers, walking out from the other side. He was still in his uniform and was wearing the biggest smile I’ve ever seen (and that’s saying something). He broke the silence (like only Hank can) by yelling “I see y’all holding hands!”. As he got closer, we all paused and gave each other the “did that just really happen” look. Then he gave us a big hug, said “we did it!” and headed back into the locker room to join his family. Having that kind of quiet moment amidst the crazy post-game celebrations is something I’ll never forget. Finally, after we finally left the stadium at about midnight, before heading to the team party, Kadie and I went to Earl’s for a celebratory glass of Lagavulin. She bought me one after we lost in 2015 and it’s become our go-to drink for important occasions ever since. Sharing that moment with her was pretty special. Winning a championship in just three short years is something pretty darn special. Other than making sure you captured as much great #content as possible, what were you feeling as the game ended? Haha, you know it’s always about #content. As the game ended I felt happiness, relief, excitement, a massive rush of adrenaline, and probably a million other emotions. Luckily I had my co-worker Tyler with me on the sidelines, as well as a video crew, so we all alternated celebrating and capturing content. It worked out well and everyone got to enjoy the moment. Did you get a ring? Yes, I did! I actually just got it a couple days ago! OSEG was very generous and I can’t thank them enough for making the staff feel valued and part of the team. It’s something I’ll cherish forever. Obviously the decision to move on from OSEG had to be a tough one. 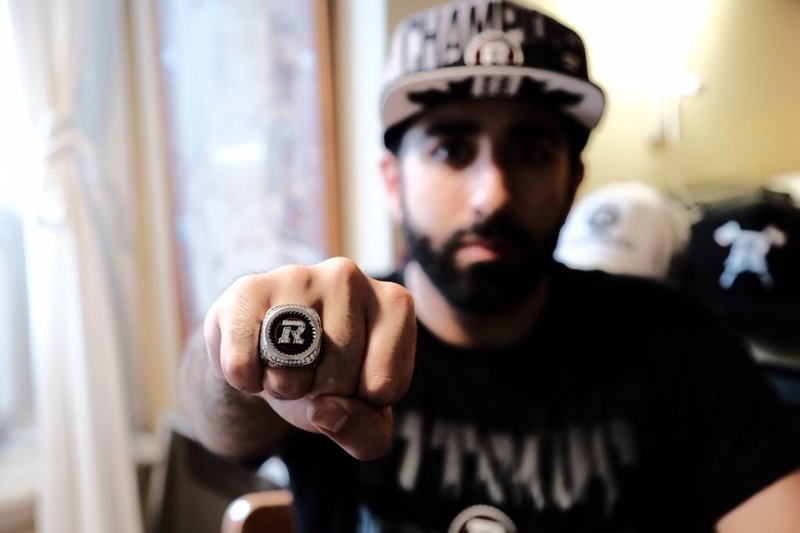 What would you say is your biggest takeaway (other than the ring) from working with the Redblacks? The decision to leave was very bittersweet, but it was time to move on. My biggest takeaway? That’s easy. It was the opportunity to travel the country, work with players, visit stadiums, and experience what the CFL truly means to Canada. The league, the players, the fans, the stadiums – they’re all sewn into the Canadian fabric. To me, the best stories are those that transcend sport, and I got to witness/be part of a lot of them in my three years in the league. Looking back at your three years, is there something you were able to capture or an initiative you spearheaded that you’re most proud of? I can’t pick one thing, but I’m most proud to see what the #RNation community has become. The return of football to Ottawa was an incredible story and I just wanted to capture every moment the best I could – from the name and logo unveil, all the way to the Grey Cup parade down Bank Street. I consider myself very lucky to have been part of it. What’s your hope/outlook for the Redblacks organization over the next 3-5 years? Obviously I hope they have continued success both on and off the field. I think the organization has set themselves up to do just that (despite their current record). The fan base is young and engaged, the stadium is beautiful, and both the business and football ops staff see the bigger picture. I’m really excited to see the Grey Cup here in November. It’s going to be awesome. Now that you’re experiencing the Redblacks as a fan, have you made it to the Brewer Park tailgate yet? I haven’t yet, but will definitely make an effort to before the season ends. My parents have been and say it’s a lot of fun. What was the impetus for your new venture? What is the hole in the marketplace that you are filling? The timing was right and Kadie and I had a mutual desire to start something of our own. From there, Harbourfront Media was born! We both love telling stories and have a good understanding and feel for the social media space. Our focus is on using strong engagement and meaningful content to produce brand strategies that help tell a story and create a connection between the brand and their audience. At the moment we’re working with various-sized clients, but I think our real end-goal is to work with small and medium-sized businesses to create and implement social/content strategies, then help set up their internal team for success down the road. Harbourfront Media is looking after the CFL’s official Grey Cup Festival account, @GreyCupFestival. What is the goal/plan for this year? Our goal to to make this year’s Festival account the most accessible, fun, engaging, and content-focused it has ever been. We really want to highlight the festival themes of inclusiveness, Canadiana, grassroots, Canada 150, and #OurNation. We basically want to act as a virtual concierge that also produces meaningful content to tell the story of the Grey Cup Festival. The idea is to take the key learnings from our combined time at the Redblacks, Argos and Lions, and apply them to the Festival accounts. What’s the next big thing in social media? Live video. Location marketing. Influencer marketing. Also keep an eye out for brands utilizing messaging services like Facebook Messenger and WhatsApp. Who is looking after @Redblacks these days? What were your parting words of wisdom for him/her? 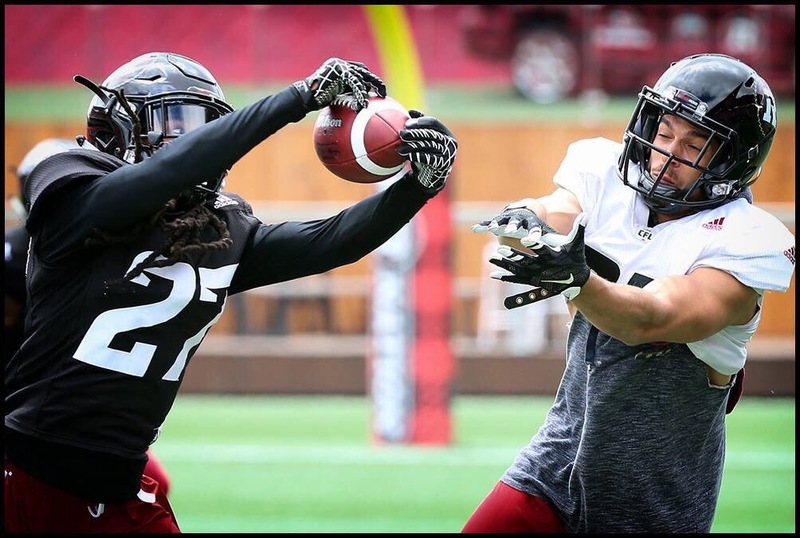 It’s a combination of very talented folks, but Tyler Rabb is mostly running point on Redblacks social this season. I also said to have fun and enjoy the ride. There’s only eight other people in Canada who have this job, so consider yourself lucky. On behalf of Redblacks fans everywhere, I want to thank you for all your work and dedication to bringing us closer to our team. 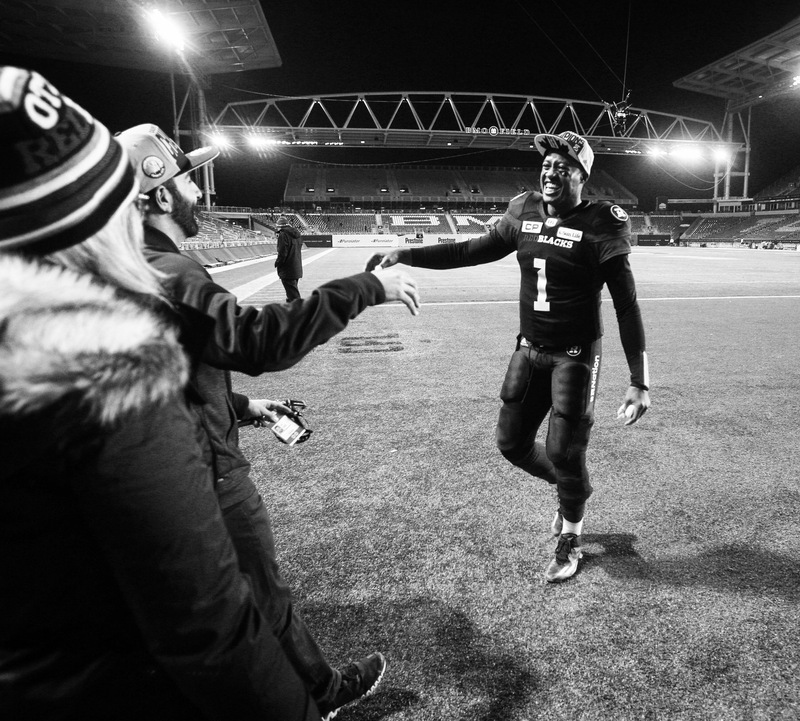 You really understand what #RNation means and made sure every fan felt included. Great job. That means a lot to me. I really appreciate the kind words. I’m glad I could play a small part in bringing football back to the nation’s capital. I loved every moment of it. Follow Mat on Twitter at @smith_mat. Check out Harbourfront Media on Twitter at @HBFMedia. Enough leadership on Redblacks roster to defend Grey Cup? With nine games down in the 2017 Canadian Football League season, the Ottawa Redblacks have been less than spectacular, to put it nicely, sitting third in the East with a 2-6-1 record. Hopes were high for the Grey Cup champs coming into the season, with the return of stand-out running back William Powell (who missed all of 2016), heaps of talent coming in via free agency (including LB Khalil Bass, DB A.J. Jefferson and receivers Diontae Spencer & Kenny Shaw), and of course the chance to defend the Grey Cup at home. Yet, here we are, nine games in and only a measly pair of victories. You can’t take the leadership of a team away and expect the same results. This is not the same Redblacks team from the last two years!!! Without a doubt, Burris’ leadership and experience are a massive loss. Even at 41 last season, he was effectively reading blitzes and able to change plays at the line of scrimmage. Burris was the face of the Redblacks for the first three years, put the team on his back when necessary and the rest of the team rallied around him. Now, don’t get me wrong: Trevor Harris is a leader, and appears to be a damn good one. But Harris is only one of several players needed to fill the holes left following the Grey Cup victory. So far, it appears Ottawa just lost too many veterans in the off-season to be able to play like they did in 2015 and the first and last thirds of 2016. With half a season still to play, they need guys to step up, fast. So, who will step up? Right now, The Buds® look to be filling the void. 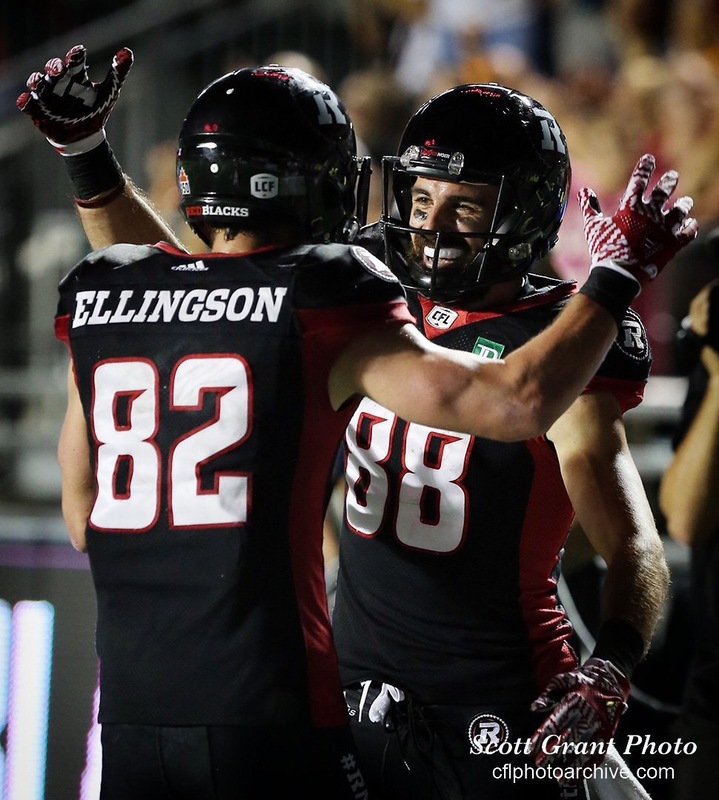 At #1 and #3 in CFL receiving yards and huge fan favourites, Greg Ellingson and Brad Sinopoli lead by example. Still to be seen whether they develop into more vocal leaders. Could be a big factor in a Redblacks turnaround this year and beyond. The loss of Moton Hopkins cannot be understated. Yes, he is still with the team as an assistant coach, but impact on the field and in the locker room matters. A fan favourite and team captain, Hopkins was there to get his team fired up. That attitude/swagger/confidence is not the easiest to replace, but a couple guys that look like naturals to step in are Zack Evans and Arnaud Gascon-Nadon. Both are veterans with championships under their belts. No single group was hit harder this offseason than the secondary. #DBlock lost a lot of talent and valuable leadership in Abdul Kanneh (HAM), Forrest Hightower (NFL, now with EDM) and Mitchell White (NFL). All were all-star-calibre players who could get people fired up – both teammates and fans. With all three gone, someone in the secondary needs to step up and continue their legacy. I believe Sherrod Baltimore could be that guy. Since getting in the lineup, Baltimore hasn’t stopped playing hard, with both passion and heart! As veterans, Jerrell Gavins and Jonathan Rose are also being asked to do more in leading an inexperienced group. If these first three years have shown us anything it’s that when #DBlock plays well, the Redblacks play well. The Redblacks are at the halfway point in the regular season, with nine games left. Not saying they’ll win them all, but taking a quick peek at the schedule you can see some favourable opponents, with Ottawa facing Hamilton, Saskatchewan and Montreal twice each. If the Redblacks can win at least five of their remaining nine games, that may well be enough to make the playoffs and get a chance to defend the title at home. This can only be achieved from within, however, and the Redblacks need to find ways to turn those last-second losses into victories. That will take more complete team efforts like last week in Hamilton, supported by confidence and execution from a young leadership group. Only then can we start to get serious about a third straight Grey Cup appearance. Follow me on Twitter at @mattmthekid1. Thanks for reading! Follow us on Twitter at @DefendTheR. All photos courtesy Scott Grant Photography. Follow Scott on Twitter at @CFLPhotoArchive.